A few weeks ago, while taking stock of the items in our larder, I discovered, hidden away on a back shelf, 3 cans of Goya Garbanzos, which were due to reach their expiration date in a few months. Whether or not an expiration date imprinted on a can should be believed is irrelevant; as in this case, the serendipitous discovery of this legume pretty much determined that they would be consumed long before then. As I wrote several years ago, Grandma Loved Ceci Beans, or Chick Peas, or Garbanzos, as they are also known, depending upon your ethnicity. 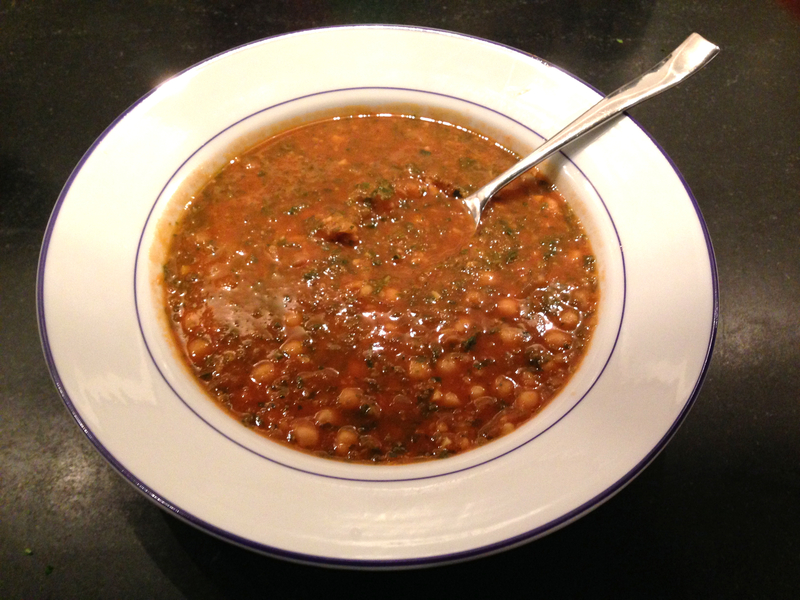 I never appreciated them until on a visit to Tuscany some years back I devoured a sublime Ceci Bean Soup in a little restaurant in the hill town of Vagliagli, where we had rented a villa with two other couples. This soup has been on my mind ever since. Now was the time to act. 1. In a three-quart pot, heat olive oil, add garlic and onion and lightly sauté until translucent. 2. Add Garbanzos and mix well. 4. Add chicken broth and bring to boil. 5. Boil on medium high for 15 minutes. 6. Remove 3 cups of the beans, purée in food processor and add back to pot. Note: If you are unable to locate Hot Hungarian Paprika, you can get close to it by using Regular Paprika and Cayenne Pepper in a 3:1 ratio. Serve with grated Parmigiano – Reggiano and Extra Virgin Olive Oil. 1. In an 8 quart pot, heat olive oil on medium. 2. Add onion and garlic, reduce heat to medium-low and cook 5 minutes. 3. Add 3 cans of the beans, stir well and cook 5 minutes. 4. Add sausage, raise heat to medium, cook 3 minutes. 5. Add water and broth, stir well and bring to a boil. 6. When soup is at a full boil, add kale and potatoes, stir well and return to a boil. 7. Reduce heat to medium and boil uncovered for 1 hour. 8. Mash 1 can (2 cups) of the beans in a food processor and stir into the soup. 9. Add the remaining 2 cans of beans to the soup and stir. 10. Reduce heat to medium-low and simmer, uncovered, for an additional hour. 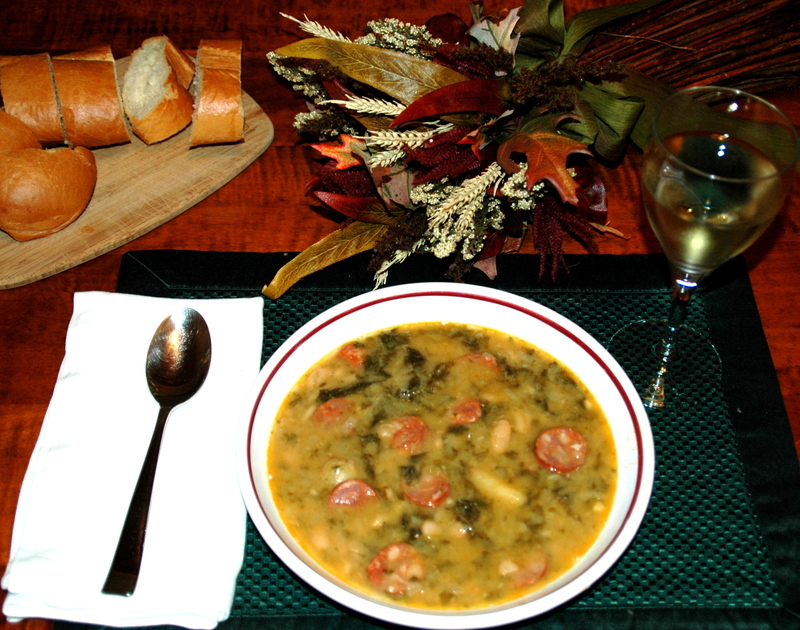 Serve as a meal along with warm, crusty bread. Leftovers may be frozen in 1 or 2 quart containers to serve as additional meals during the long, cold, winter. Return the heat to medium, add 1/4 cup of water and add the kale in bunches stirring continuously so it does not burn. Continue adding water and kale until the kale cooks down. Cover, steam on high for 8 minutes. * Kale is usually sold in bunches in the supermarket. It has to be washed, trimmed and hand chopped before serving. Recently we discovered pre-washed, trimmed and chopped ‘Kale Greens’ packaged and sold like washed spinach and salad greens. It is produced by Glory Foods, which produces other similarly packaged, fresh, ready to cook produce that are great time savers. Big Mike‘s older brother Fred was my godfather and favorite uncle. Fred was born in Italy and at the age of 7 emigrated to the U.S. aboard the Principe di Piemonte, accompanied by his mother and two younger sisters. 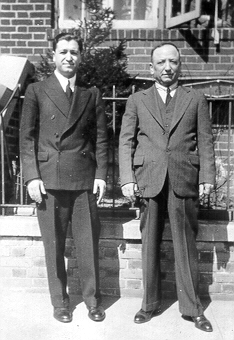 They were met in New York by my grandfather, who had arrived in the U.S. a few years earlier in order to get established. Big Mike was born three years later in what was then known as Italian Harlem. Grandpa later moved the family to Yorkville, where he had a shoemaker business and where Big Mike grew up before he left for service with the CCC. Later grandpa and grandma moved to DeKalb Avenue off of Gun Hill Road in The Bronx, where, I believe, this photo was taken. Fred was a consummate New Yorker whose sartorial elegance can be attested to in the above photo. He raised his family in Parkchester, the Bronx, while working for the Agence France-Presse in Midtown Manhattan. When Fred retired in the 1960s, he and his wife moved to Falmouth on Cape Cod. My wife and I, along with our two daughters, spent many summers on the Cape during the 1970s, 80s and 90s, before establishing residency there ourselves, a few years ago. During those summers we always stopped in to see Uncle Fred and Aunt Jo and bring them a supply of provisions from New York, which were unattainable on The Cape. Fred invariably reciprocated with something from his freezer, which would serve as our first night’s dinner in our rental house. He also was generous in sharing his recipes, one of which was ‘Kale with Black Olives’. Kale, a dark leafy vegetable that serves as an excellent source of vitamins A and C, calcium and fiber, was one of his favorite vegetables and he used it both as a side dish and in soups. 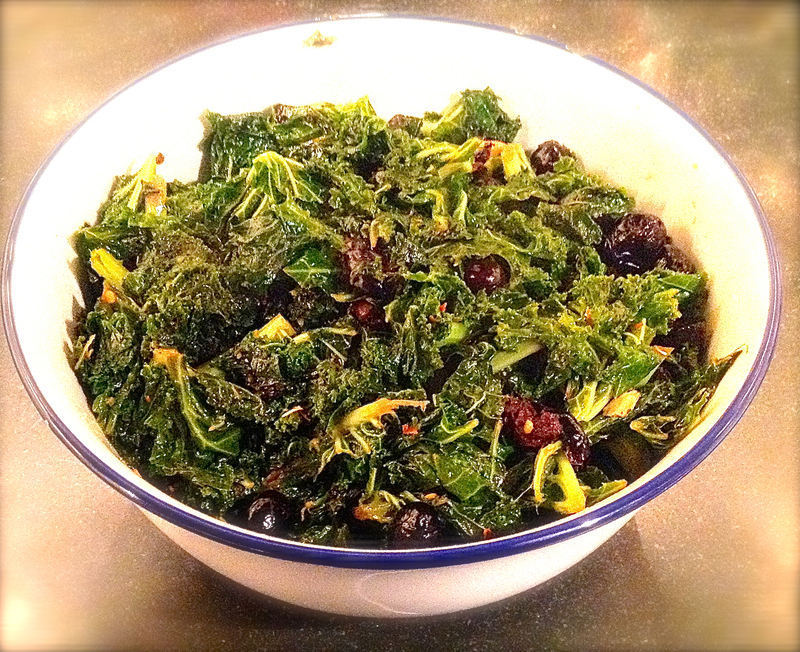 More of his recipes will be published in the future, but for now, I begin my tribute to Uncle Fred with Kale Steamed with Black Olives.